"My lousy guitar skills are an illuuuuusion!" Snow Leopard has a problem with MKV files. Oh bother. 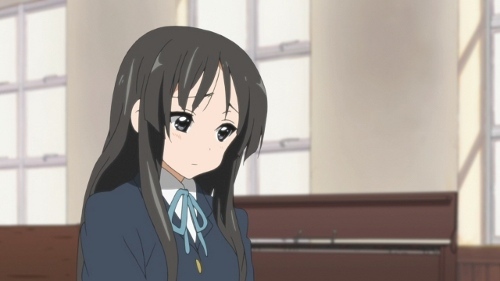 It's been almost another week since I posted about episode 01 of K-On!. I gotta say having them in widescreen was worth the wait, on my old anime blog I would never review a show until it was in syndication because the DVD releases are higher quality and because when I get into a show I can't stand having to wait for the next one to come out! Short, fickle attention spans are… oh look at the cat. "I just wanted to be a band, not for anyone to see me!" Having committed herself to joining the light music club, Yui now faces the daunting task of actually learning how to play the gosh darn guitar, only a minor inconvenience when she's the lead of the band! 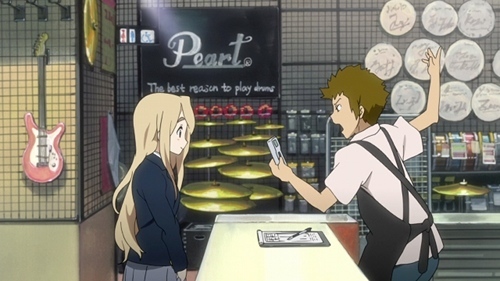 It's even worse than this though, because she doesn't even have a guitar and certainly doesn't have the 50,000 yen to buy a decent one. A fail trifecta! Not to worry though, because at this stage the Light Music Club is basically a Parisian cafe with cakes and tea that the ever so gracious Tsumugi provides. Honestly I can't really play any musical instruments well except for the drums and even then I'm terrible, but I'd go along with the flow and join a music club if I was offered all that good stuff in return :). Wonder if she can make a killer latte? "Aw, you don’t want to make me mad do you?" Unlike most other shows where the first episode establishes most of the cast, we're given an extended introduction through the eyes of Yui of the personalities of her friends. I think we'd all pretty much much established it all for ourselves, but fair enough! 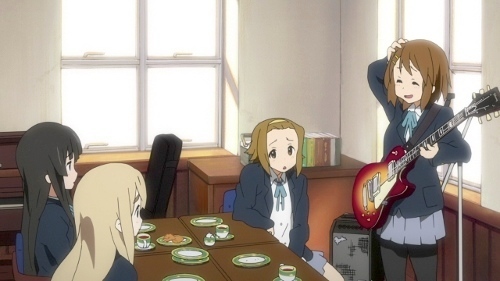 Most of the rest of the epsode consists of Yui falling in love with a Les Paul electric guitar, seeing the 250,000 price tag and proceeding to figure out how the heck she can afford it. The club members pitch in and help her by taking up some dull, repetitive work but they simply can't make it up fast enough. Fortunately the rich and gracious Tsumugi can offer her services not by buying it outright but by providing certain "persuasive" arguments. I need someone like that for me at Apple, Sun Microsystems and/or Lenovo! "How do you make the sound come out!?" Yes in the end she gets her beloved guitar and yes she does look like a real musician, even if her guitar skills are as good as mine. Don't unplug that while the volume is still turned up! Argh! What I continually love about this show aside from it's lighthearted nature and high life escape value is the characters are well defined. 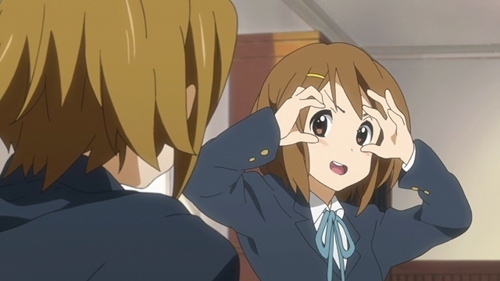 I've read plenty of scathing reviews of K-On where people proudly state that they hate them, but I like the way that Mio and Ritsu especially will display irritation and frustration just as I imagine many of us would in certain situations. A moeblob fanservice flick wouldn't have that. Disagree? Fair enough, don't watch it then!